In Ein Karem, Ancient Biblical Life Is Revived in a Modern Israeli City - Breaking Israel News | Latest News. Biblical Perspective. The Jerusalem neighborhood of Ein Kerem (Uri Baruch). Inset: Ein Kerem in 1948 (Palmach Archive). The sights, sounds and fragrances of the Yemenite Village in the Jerusalem neighborhood of Ein Kerem have the power to transport visitors back thousands of years to Biblical times. The rich history of Ein Kerem spans more than three millennia and tells the story of Jewish survival, restoration and continuity in the Land of Israel. Scholars believe that the modern neighborhood of Ein Kerem stands in the place of the Biblical village of Beit Hakerem mentioned in the Book of Jeremiah. Existence of Jewish life in this area during the Second Temple period is indisputable. Ancient ritual baths known in Hebrew as mikvehs, used by Jewish priests prior to performing services in the nearby Temple, have been discovered in recent years under a number of homes in the area. The uncovering of ancient wine and oil presses serve as further irrefutable proof of the Jewish claim to Jerusalem. After the exile of the Jewish people following the destruction of the Second Temple, the Land of Israel lay desolate, waiting for the return of its people. Ein Kerem, a vibrant and flourishing neighborhood in the times of the Temple, waited thousands of years for the Jews to be redeemed and returned to the borders of the Land in the ultimate fulfilment of Biblical prophecy. In 1949, shortly after the founding of the state, the Israeli government helped Jews settle the neighborhood of Ein Kerem with immigrants from Yemen. With much labor, intensive work in the fields and eager new residents, the neighborhood of Ein Kerem was born once again and became home to a flourishing Yemenite community. Efrat Giat, a modern-day shepherdess who lives in the Yemenite Village of Ein Kerem along with her husband, a child of Yemenite immigrants amongst the first Jews to settle Ein Kerem, and five children, is a prime example of the ingathering of the exiles and the re-establishment of Jewish sovereignty in the Land of Israel. Seeing herself as a modern reincarnation of Rachel, the Biblical matriarch, Giat combines her modern life with the ancient Biblical essence of the land on which she lives. 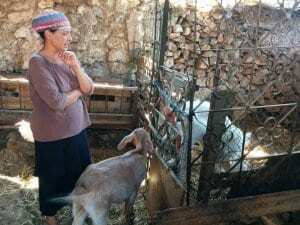 Once a successful tour guide, Giat now spends her time tending to her herd of goats, working the land, and reviving authentic Jewish life in Israel as described in the Bible. While Giat’s routine includes computer work, chauffeuring her kids back and forth to school and running errands, she is equally rooted in the nature of the land. The Bible speaks of the Jewish people in the Land of Israel as family-oriented shepherds and farmers. The first time a female is described as a shepherdess in the Bible appears in relation to Rachel. With the return of the Jewish people, Giat believes it is vital to maintain these Biblical values and pass them on to her children. Watching Giat tend to her flock, interact with her young children, harvest the fruits of her trees and orchards, which bear the seven varieties of fruit native to the Land of Israel, and make goat cheese allows visitors to envision what life would have looked like in the same region thousands of years ago. In the Ein Kerem valley, Giat points out three of her relatives’ homes. These families have made the conscious decision to live close to one another in what Giat calls “a tribe”, echoing how the children of Israel lived in tribes in the times of the Bible. Likewise, Giat and her extended family live an ancient, more communal lifestyle, assisting one another in tending to their animals, raising children, and lending a helping hand when needed. Giat does not hesitate to proclaim her wonderment at the fact that she is living in the miraculous times of the fulfillment of the promises of the Biblical prophets. 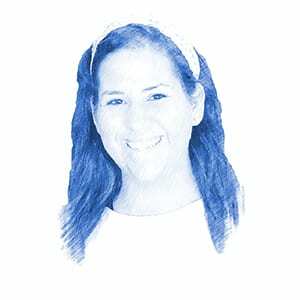 Seventy years after the establishment of the State of Israel, Giat is living in her ancestral homeland in a manner not dissimilar to her biblical matriarchs and patriarchs. Standing on the lookout of the Giat backyard with the wind blowing above, the goats grazing below, and the hills of Jerusalem all around, the hand of God in history and the rightful return of the Jewish people to the Land of Israel can not be clearer. The story of Ein Kerem’s revival appears in Then & Now: 12-Month Jewish Calendar and Holiday Guide 2018 by Israel365. Click here to learn more and purchase. Orly Gibson was born and raised in Toronto, Canada. She received an Hon B.A. in Religious Studies from York University. After moving to Israel, she earned her M.A in Contemporary Jewish History. Orly lives in Ramat Bet Shemesh with her husband and three children.